Having completed his survey of Eastern philosophy, Capra turns to “The Parallels” between Eastern philosophy and quantum physics. Chapter 10 is called “The Unity of All Things.” Capra begins by saying, “The most important characteristic of the Eastern world view... is the awareness of the unity and mutual interrelation of all things and events.”1 This is a mystical view, the view of Eastern mysticism, and it agrees with the view of modern physics. It’s also an “important characteristic” of the occult worldview. The occult is all about connections between seemingly disparate things: telepathic connections between people who are far apart, connections between people and animals, connections between people and inanimate objects, etc., etc. So the “connectedness” of the world is an important feature of the mystical worldview, the quantum worldview, and the occult worldview. By overlooking the occult worldview, Capra overlooks one of the most interesting and important parts of the argument. The Philosophy of Today should bring together all three — the mystical, the scientific, and the occult. A book about the Philosophy of Today should perhaps be titled Connections. No man is an island, entire of itself; every man is a piece of the continent, a part of the main... any man’s death diminishes me, because I am involved in mankind; and therefore never send to know for whom the bell tolls; it tolls for thee. Capra says that “the basic attitude of modern science [is] that all its concepts and theories are approximate”5 and therefore we can’t precisely define a distinct physical entity. Here, too, there may be a parallel with the philosophy of history, since concepts like renaissance and decadence can never be defined with mathematical precision. Capra concludes this chapter by saying that Niels Bohr visited China in 1937, and was impressed by the similarity between the Chinese approach to opposites and the quantum approach. He maintained his interest in Chinese thought, and when he was knighted by the Danish government, he chose as his coat-of-arms the yin-yang symbol, with the phrase Contraria Sunt Complementa (opposites are complementary). Chapter 12, “Space-Time,” is one of the longest and most difficult chapters in the book, but it’s very interesting — so interesting that I decided Capra is as good as Zukav, as relevant to the occult as Zukav, and I decided that I should continue studying quantum physics because I still haven’t exhausted its philosophical import. Chapter 12 begins by saying that geometry (Euclidean geometry) played an important role in Greek thought; it was the “central feature” of Greek math, and its deductive mode of reasoning influenced Greek philosophy. The gate over Plato’s Academy said, “Study Geometry Before You Enter Here.” “Plato believed that the atoms of the four elements had the shapes of regular solids.”8 According to Plato, God is a geometer. It was believed that geometry wasn’t just a mental construct, it was part of nature itself. This belief lasted until Einstein. The intimate link between space and time was well known in astronomy, in a different context, long before relativity theory. Astronomers... deal with extremely large distances, and here again the fact that light needs some time to travel from the observed object to the observer is important. Because of the finite velocity of light, the astronomer never looks at the universe in its present state, but always looks back into the past. It takes light eight minutes to travel from the Sun to the Earth, and hence we see the Sun, at any moment, as it existed eight minutes ago. Similarly, we see the nearest star as it existed four years ago, and with our powerful telescopes we can see galaxies as they existed millions of years ago. Capra points out that, before Einstein introduced the idea of a curved space, a non-Euclidean space, the mathematician Georg Riemann had developed a non-Euclidean geometry, unaware that his new geometry reflected reality itself. The curvature of space is most pronounced in the case of a black hole, which is so massive, and exerts so much gravitational force, that light can’t escape. Here on earth, however, our everyday notions of Euclidean space and absolute time are usually valid. Capra says that the world of space-time resembles the timeless world of the mystic. But someone receptive to the occult would say that it bears a striking resemblance to the occult worldview, according to which it’s possible to foresee the future since the future already exists. Thus, quantum physics confirms the occult worldview in the most striking way. Chapter 13, “The Dynamic Universe,” is also a stimulating chapter, highly relevant to philosophy. Capra says that movement and change is the way of nature, and we must accept that nothing is permanent. Einstein showed that matter and energy are equivalent. Thus, particles aren’t “grains of matter,” they’re energy, they’re process, they’re relationship.17 Likewise, Eastern philosophy always denied “the existence of any material substance.”18 Capra quotes Joseph Needham: “While European philosophy tended to find reality in substance, Chinese philosophy tended to find it in relation.”19 Instead of speaking of “thing” and “substance,” Eastern philosophy speaks of “event” and “deed.” “Buddhists understand our experience in terms of time and movement.... Buddhists see all objects as processes in a universal flux.”20 The world as conceived by Eastern philosophy isn’t the static world of Euclid, it’s the dynamic world of Einstein. This scientific view agrees with the occult/mystical/Eastern view that the universe is suffused with a kind of life/energy/consciousness. If inanimate matter were entirely dead/dumb/inert, it’s hard to see how there could be any communication, any connection, between living things and inanimate things. Because matter has a kind of life, it’s possible for matter to have some sort of connection/communication with people. As I argued in a previous issue, “everything is connected.” Matter can communicate with people, and distant particles can communicate with each other. The universe is alive. Capra points out that not only are subatomic particles constantly in motion, but very large things are also constantly in motion: stars aren’t static and permanent, they’re evolving and changing. Likewise, galaxies aren’t static, they rotate. Finally, the universe itself is expanding, not static. So change and movement are continual — in both the microscopic world and the macroscopic world. 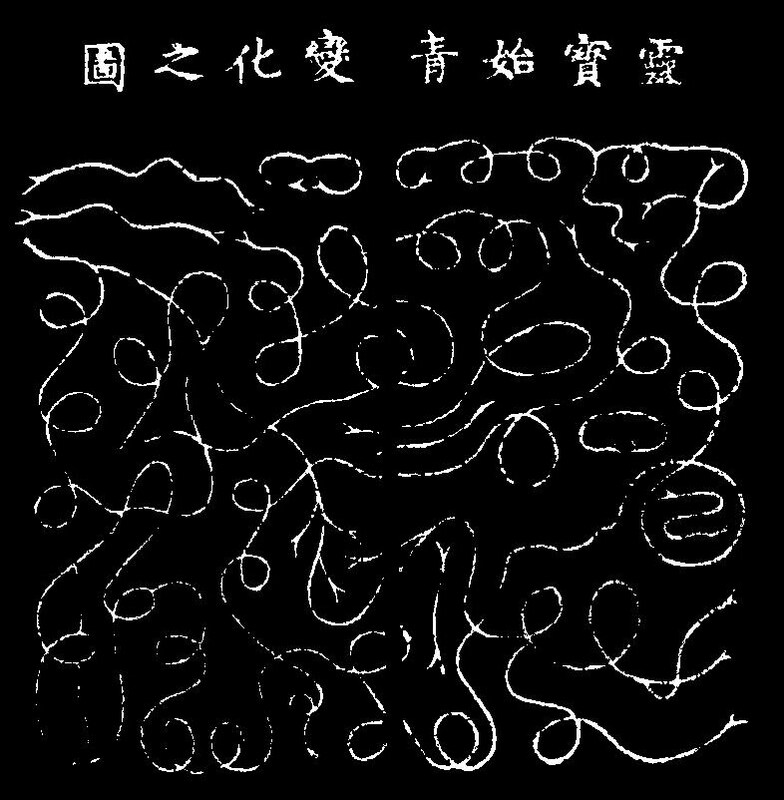 Chapter 14, “Emptiness and Form,” is also most interesting. While the previous chapter argued that matter is restless, constantly moving, and has a kind of life, this chapter argues that empty space also has a kind of life. In fact, there’s no sharp boundary between matter and void, they’re both a field, an energy field. Out of the void can come particles, and particles can vanish into the void. Just as Eastern philosophy blurs the boundary between Self and World, so modern physics blurs the boundary between matter and the surrounding space. The whole universe, both “matter” and “emptiness,” is buzzing with energy, with a kind of life, with what the Chinese called ch’i (also spelled qi). Just as there’s no “dead matter,” so too there’s no “dead space.” The universe is one, and the universe is alive, and all parts of the universe are connected to, one might say communicating with, all other parts. So modern physics and Eastern philosophy agree that the universe is a field, and the field is (often) invisible and immaterial. Doesn’t this support the occult worldview? Occult phenomena are generally invisible and immaterial; the word “occult” originally meant “hidden.” A rational thinker might say, “How can there be life after death if there’s no ‘stuff’ after death? How can ghosts exist if they have nothing solid or tangible?” But now we see that we have no “solid stuff” even while we’re alive, we’re really just energy, just field. Capra discusses the concept of a field, noting that it originated with Faraday’s and Maxwell’s work with electricity. Then gravity was also treated as a field. While electromagnetic force could be either attraction or repulsion, gravitational force was always attraction. Furthermore, Einstein showed that gravitational force curved space. Einstein’s relativity theory blurred the distinction between matter and space, just as quantum field theory blurred that distinction. One comes away from Capra’s book thinking that the Eastern thinkers were closer to the truth than the Greeks, especially the Greek atomists/rationalists/Euclideans. This suggests that Eastern views on other subjects — religion, ethics, etc. — may well be closer to the truth, too. The various facets of philosophy are related, and if the Eastern view of the universe is on target, this should predispose us in favor of Eastern views on other subjects. As they say on Wall Street, when shares of Euclid, Democritus, and Newton start falling, it’s time to sell Socrates and Plato. Several decades ago, when I was writing about the life- and death-instincts of societies, I asked, What exactly is a life-instinct? Now I would answer thus: Society’s instincts aren’t material things, they’re energy, they’re ch’i, they’re fields. As a gravitational field operates in a certain area, so the instincts of society operate in a certain area, in a certain society, not throughout the world (though someday the world may become one society, under the sway of the same instinct). In classical physics, force and matter were distinct. In modern physics, however, force and matter are the same; forces are particle-exchanges; “the concept of force is therefore no longer useful in subatomic physics.”31 Newton described objects affected by external forces, but in modern physics, and in Eastern philosophy, objects are themselves forces: “Eastern mysticism... regards motion and change as essential and intrinsic properties of all things.”32 This view that force is internal, not external, adds to the picture of the universe as having a kind of life — there is no dead matter, no inert matter. Not only is the world of “stuff” alive, but the world of “empty space” is also alive. I recently visited my old haunts in the Concord-Lincoln area. One of the highlights of my visit was a guided tour of the Old Manse, which is near the North Bridge, where the Concord Battle took place. Emerson wrote “Nature” during a brief sojourn in the Old Manse. Hawthorne lived in the Old Manse for three years, and wrote a short-story collection, Mosses From An Old Manse. You can still see the words that Hawthorne and his wife, Sophia Peabody Hawthorne, inscribed on the window-panes with Sophia’s diamond ring. The Codman Estate has an interesting Italianate garden. This walk is 7.5 miles. It starts and ends at the Lincoln schools on Ballfield Road. It goes through several fields, so there may be ticks; you may want to take this walk in winter, when ticks aren�t around. Below is a map for people who have an interest in modern architecture. It shows developments in the Concord-Lexington area that were built by Gropius and other AvantGarde architects. Some of these developments had a socialist/utopian aspiration, and they featured shared pools, tennis courts, trails, etc. I call this route “Three Ponds” because it goes along Sandy Pond (also called Flint’s Pond), then Walden Pond, and finally Farrar Pond. It’s 9.3 miles. It starts and ends at the Lincoln Train Station (I’ve marked two other parking possibilities). Most of it is on packed earth, where there are few ticks; much of it is under tall pines. There are some short stretches on roads, but the roads are quiet, or have sidewalks. Here’s a route that starts at the North Bridge Visitors Center, then loops through Great Meadows, then walks through downtown Concord. It doesn’t go through Sleepy Hollow Cemetery. This route is 8.5 miles. You can park near the North Bridge and the Old Manse, and visit both sights. Then walk south on Monument Street (toward Concord Center) for about 250 yards. Turn left onto a trail that heads east, toward Bedford. 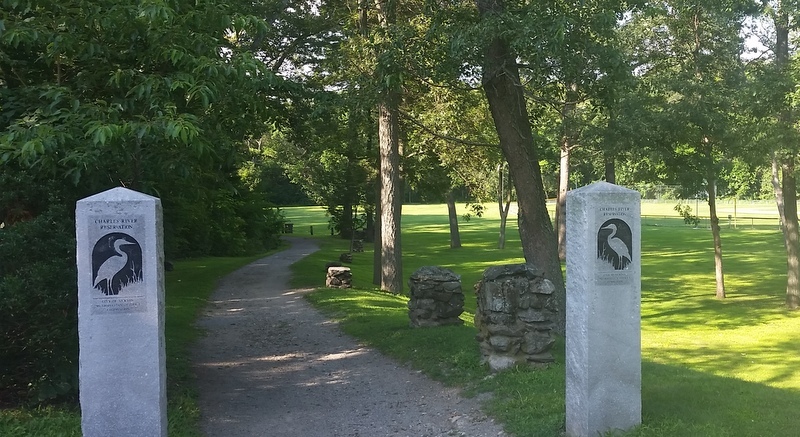 Walk about 600 yards until you see a big, stone marker on your right, and a path (the marker mentions the Concord Battle). Take the path to the right (south), and in about 10 minutes you’ll be in the rear section of Sleepy Hollow Cemetery, near Authors Ridge, where you’ll find the graves of Emerson, Thoreau, Alcott, Hawthorne, etc. If you walk through the cemetery (toward the south), you’ll come out near the center of Concord, then you can take Monument Street back to the North Bridge. I began my visit to Concord-Lincoln by parking at Walden Pond, and taking a 4-5 mile walk that I call The Adams Woods Circle. If it’s a hot day, you may want to swim in Walden Pond, which is large, clean, and clear enough for snorkeling (Thoreau would surely have been an avid snorkeler). If you’re interested in Thoreau, the shop at Walden Pond has a great collection of books and memorabilia. There were several Russians at Walden Pond, and when I was on Nantucket a few weeks ago, there were Russians everywhere. I’m not sure how to explain this influx of Russians, some of whom are teenagers with summer jobs, while others are adults with permanent jobs. I started at Walden’s beach (where the changing house is, close to the parking lot), then walked along the left side of the pond (the south side) for about .8 miles. A circle of the pond is about 2 miles, so I walked slightly less than halfway around, to a cove that the map calls Long Cove. Then I took a sharp left turn, and crossed the railroad tracks. If the trail around the pond is blocked, to protect the shoreline from erosion, you can follow Esker Trail, which is a bit further from the shore. The trail to Mt. Misery crosses some tiny roads and small clearings, and goes through some stands of giant pines; after about 10 minutes, you break out into an open field and a charming farm. You have to turn right (west), but after a short distance (100 yards? ), turn left (east) and walk into the middle of the farm. Then I turned right (south), and bushwhacked through high grass to St. Anne’s Church, on Concord Road (Route 126). To avoid this high grass (the result of flooding and trail closure), skip the right turn, and go straight to Old Concord Road, then turn left to Concord Road. Either way, you’ll be on Concord Road, and you can turn left (north), and walk back to Walden Pond (a bike path along Concord Road makes the walk a bit pleasanter). You’ll pass another farm or two as you walk along Concord Road. This is what I call The Adams Woods Circle. If you’re more ambitious, you can try what I call The Great Circle. Follow the directions for The Adams Woods Circle until you come to “an open field and a charming farm. You have to turn right (west), but after a short distance (100 yards? ), turn left (east).” For The Great Circle, don’t make this last left turn, just keep going west, you’ll see signs for Mt. Misery, which will be on your left. Your goal is the canoe landing and parking area, which is on Route 117 (South Great Road), close to the Sudbury River. To reach this goal, you can stay to the right (west), or you can go left (south) and climb Mt. Misery (just a small hill), then turn to the west. Once you reach the parking lot and the Sudbury River, cross Route 117 to Farrar Meadow (follow the trail markers, or use a map), then follow the trail as it winds around the south side of Farrar Pond. At the end of Farrar Pond, I usually turn left (north), then a right (east) brings you to Concord Road (Route 126). Turn left (north) on Concord Road, and you’ll get back to Walden Pond. Since it’s a long walk, and not very interesting, you may want to leave a bike, or a second car, somewhere near Concord Road. Or you can return to Walden Pond via Adams Woods. If The Adams Woods Circle is 4-5 miles, The Great Circle is 8-9 miles. If you want to see Mt. Misery and Farrar Pond without taking a long walk, you can park at St. Anne’s Church, or on Old Concord Road, thus skipping the first half of The Great Circle (skipping the Adams Woods portion). Here’s a 5-mile walk that starts at Lincoln train station, then goes around Mt. Misery, then to a charming picnic spot on the Sudbury River. This route is a blend of forest, field, pond, and river. There are other historic sites in Concord, such as Emerson’s house, The Wayside (where Hawthorne lived later in his life, and where the Alcotts lived for three years), and Orchard House (where the Alcotts lived for twenty years). There are also other places for walking, such as Estabrook Woods (about 1,200 acres), and Great Meadows, a marshy area popular with bird-watchers. You may want to reach Concord via the train from Boston; if you drive, you’ll find that highway traffic is heavy around rush hour (but not as heavy on Route 495 as on 95). Here�s a 1.25-mile route (2.5 miles round-trip) in Wilmington, MA, a short drive northeast of Concord. This route follows the Middlesex Canal, which was built around 1800. Much of this route is on a towpath near the canal. The canal itself is usually dry now. I marked a gap in the route, where a short bridge may be needed. The route starts at a town park, which has a parking lot. When I walked this route, one of the walkers was Jim Baldwin, descendant of canal engineer Loammi Baldwin. Baldwin House is now a Chinese restaurant. Another place to walk along the Middlesex Canal is at the canal museum in Billerica. I�ve heard that Mine Falls Park, in Nashua, New Hampshire, offers good views of dams, falls, mills, etc. Below is another stretch of the Middlesex Canal. The northern end is a large parking lot, the southern end is a monument called the �Sagamore John Monument.� You can see some of the old berms and towpaths. This walk is 1.5 miles (3 miles round-trip). The canal went along what are now Sagamore and Boston Streets in Medford. 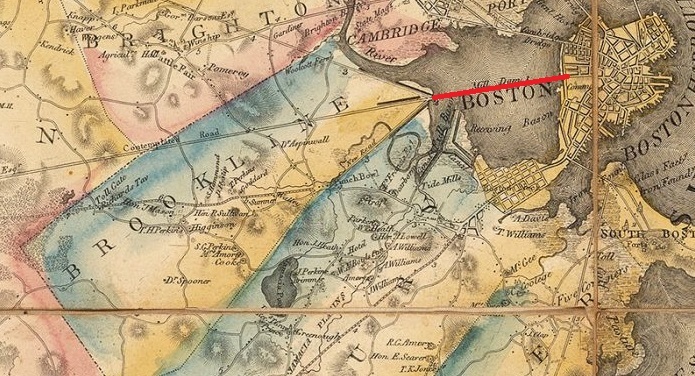 Click here for an old map of the southern section of the canal. Click here for a guide to 15 sites in Medford that are connected to a prominent family named Brooks. The writer Henry Adams was related to the Brooks family (his middle name was Brooks, and his brother�s name was Brooks). Here�s a one-mile hike to Tippling Rock in Sudbury, Massachusetts (actually it ends about 20 yards from Tippling Rock). From Route 20, a dirt road leads to a parking area and the start of the trail. If you drive west from the parking area for about a half-mile, you�ll get to the Wayside Inn, one of the oldest inns in the U.S. It has extensive grounds (grist mill, chapel, ice house, etc.) and a welcoming atmosphere. It was originally built on the Boston Post Road — more specifically, the Upper Post Road. Tippling Rock is on a broad ledge that affords a broad view; you can see the Blue Hills, and two towers in Boston, the Prudential Center and the Hancock Building. To the northwest, you can glimpse Mt. Monadnock (if the leaves are out, you probably can�t). This hike follows the BCT (Bay Circuit Trail). If you continue on the BCT for another mile, you�ll get to Nobscot Hill. 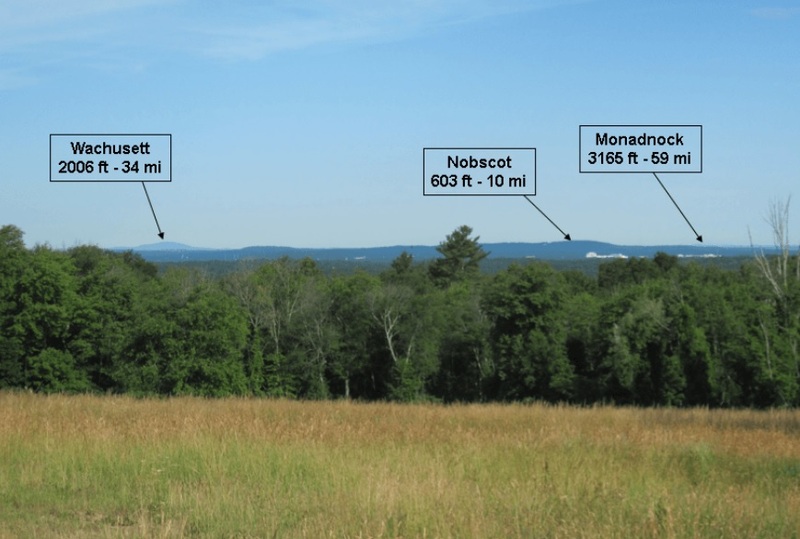 The summit of Nobscot Hill is crowded with towers (fire-spotting towers and communications towers), but if you continue on the BCT for 125 yards (descending), you�ll get to a lookout. You can see more Boston skyscrapers (not just two), but if the leaves are out, your view will be obscured. If you continue on the BCT, the guide says you�ll get �views of Mt. Wachusett and Mt. Monadnock,� but I didn�t find any such views, perhaps they�re overgrown. This is a 5-mile section (10 miles round-trip) of the Bay Circuit Trail (BCT). This section misses the scenic spots — Tippling Rock, Nobscot Hill, and the Sudbury Reservoir. I marked a mistake (I should have continued south on Wayside Inn Road to Edmands Road). To enjoy the best scenery, you may want to do the TipplingRock and SudburyReservoir sections of the BCT as two separate walks. Near the start of the walk is a short side trail to Ford�s Folly, a large dam (not very scenic) built by Henry Ford to provide water for his grist mill. Since the dam didn�t hold water, it was called a �folly�. This 6-mile circle begins at the parking lot on Brimstone Lane, then circles Ford�s Folly, then goes to Nobscot Hill and Tippling Rock before returning via roads. Since this route goes on some busy roads, I don�t recommend it, but sections of the map may be useful. This is an 8-mile walk along the Bay Circuit Trail. The land is low, lots of beaver dams/ponds, lots of mosquitoes. The trail goes through woods�only a few steps on pavement. The trail often follows old cart roads, and often goes along ridges/eskers. The last half-mile or so of this route (in the southeast) isn�t on the main Bay Circuit Trail, it�s on the Appleton branch. 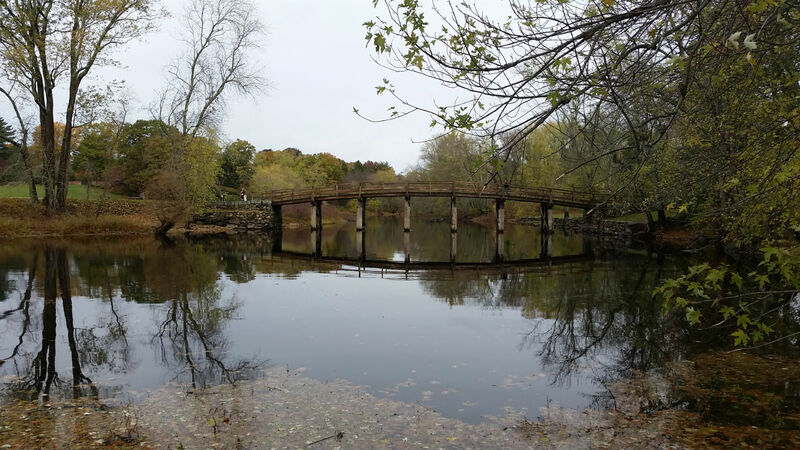 About four miles west of Sudbury�s Wayside Inn is the Assabet River Rail Trail (ARRT). The south end of this rail trail is in Marlboro; the trail goes through Hudson, Stow, and Maynard before ending in South Acton. The trail is about 12 miles long, and goes through (or near) several downtowns. A mile or two is on a dirt trail, another mile or two is on roads. If you take the ARRT from Marlboro to South Acton, then a 6-mile ride east will bring you to Concord, where you can pick up the Battle Road Trail and then the Minuteman Bikeway, and eventually reach Boston. If you want to take a train back to Marlboro, the closest stations to Marlboro are South Acton (12 miles north of Marlboro) and Southborough (6 miles south of Marlboro). 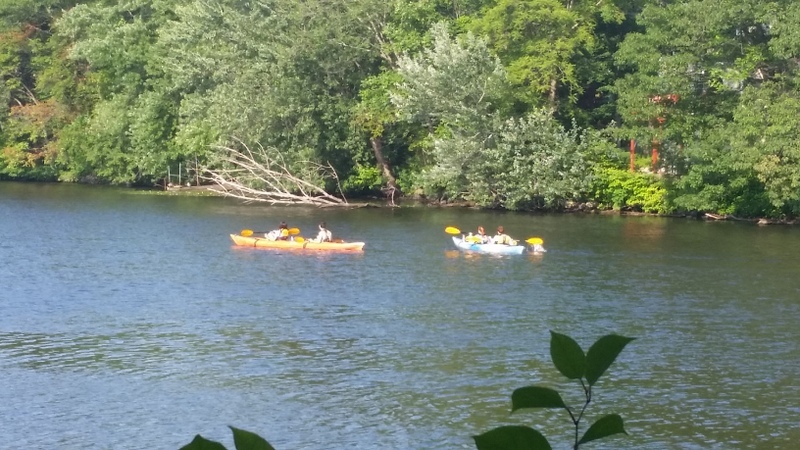 If you want to paddle the Assabet, you can go four miles from just below the Damonmill Dam to Lowell Road in Concord; you�d be paddling with the current, not against it. This section of the Assabet was designated a Wild & Scenic River. The Damonmill Dam is on Main Street (Route 62) in Concord, near the intersection with Pond Lane. 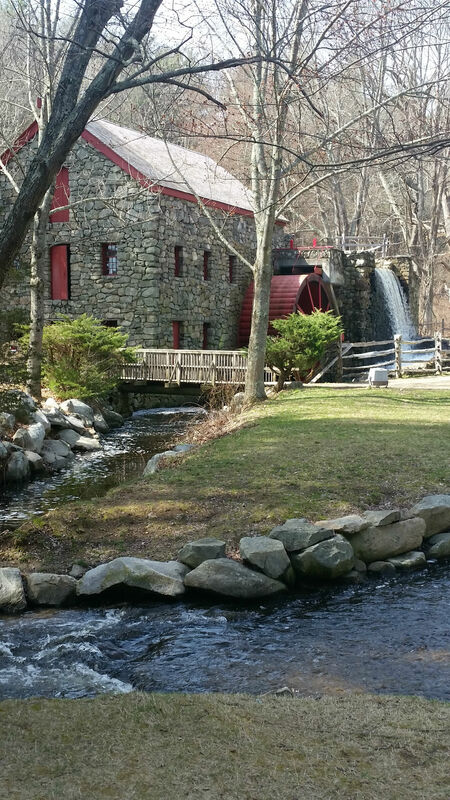 Some mills were built along the Assabet. Click here for walking tours of Maynard, tours that focus on mills, etc. If you prefer a nature walk, nearby is the 2,300-acre Assabet River National Wildlife Refuge. The Assabet and Sudbury rivers both start in Westborough, and both flow north to Concord, where they meet to form the Concord River. The Assabet flows through Hudson, Maynard, etc., the Sudbury flows further east, through Framingham, Wayland, etc. (map of drainage basins here). A group called Oars has a website with information about the Assabet, Sudbury, and Concord rivers. A good time to explore the area is during RiverFest, which takes place in mid-June. About four miles southwest of the Assabet River Rail Trail is the Sudbury Reservoir, which is actually a series of reservoirs. The Sudbury Reservoir was built between 1875 and 1900, to provide water to Boston. It was built to supplement Natick�s Cochituate Reservoir (Lake Cochituate), which had been built about 1850. The Sudbury Reservoir was rendered largely obsolete by the construction of the Wachusett Reservoir (c. 1900) and the Quabbin Reservoir (c. 1935). View from Pegan Hill, Natick, looking northwest. The route below is about 7 miles, and continues the previous map, heading southwest toward the end of the Charles River Link Trail. Below is a map of the route from Wellesley Square (Wellesley Center) to Boston. The first 7 miles follow the Charles River Link Trail, then there’s a 2-mile stretch on quiet streets to the start of the Charles River Reservation, then a 13-mile stretch along the Charles River. If you want to bike along the Charles, and skip the Charles River Link Trail, you may want to park near Auburndale Park in Newton, where the Charles River Reservation begins, then bike along the Charles to Boston, then return via train to Auburndale. These stone pillars, with blue herons, can be found all along the trail. As you bike along the Charles, you’ll pass a giant Watch Factory in Waltham; the factory made watches from about 1850 to 1950. You’ll also pass the Francis Cabot Lowell Mill in Waltham, which started about 1814, and used the power of the Charles River to make textiles. Part of the mill is now the Charles River Museum of Industry. Francis Cabot Lowell is an important figure in the history of American manufacturing. The city of Lowell, Massachusetts, is named after him (after beginning in Waltham, his company expanded to Lowell, and harnessed the power of the Merrimack River). For more on the prominent Lowell family, see The Lowells and Their Seven Worlds, by Ferris Greenslet, or The Lowells of Massachusetts, by Nina Sankovitch. James Russell Lowell was a prominent man-of-letters in the 1800s; his former home, Elmwood, is in Cambridge, near the Charles River. Robert Lowell was a prominent poet in the 20th century. Kayaks and other water-craft can be rented at Charles River Canoe & Kayak. One of the largest parks along the Charles is Cutler Park, which is mostly in Needham (small sections are in Newton and Dedham). Cutler has wide trails, and good views of the Charles River and Kendrick Pond. Cutler Park connects to historic Brook Farm. Some of Cutler’s trails are part of the “BlueHeron” trail system, which follows the Charles. Just north of Cutler Park is Nahanton Park, where you can rent a kayak. Here’s a circular trail that goes through Cutler Park and Millennium Park; it’s 8.5 miles long. If you visit Brook Farm (marked with a B), the trail will be about 2 miles longer. You may want to visit Brook Farm by car (you’ll see a sign on Baker Street for Brook Farm and Gardens Cemetery.) Little remains of the Brook Farm that Hawthorne lived at, and Thoreau jeered at. This trail isn’t one of my favorites because you’re usually near roads and houses. Most visitors to Cutler Park take the loop around Kendrick Pond. Dedham was founded early (1635), and has many historic houses, churches, and mills. Like Concord, Dedham was founded to relieve population pressure, and to act as a buffer against Indians and Dutch (it is said that Ipswich was founded as a defense against French assault from Canada). Dedham originally stretched all the way to Rhode Island. Dedham has three town commons (marked with C on the map). You can also explore old mill sites along Mother Brook. Click here for a walking tour, or here for a canoe tour. The Charles River starts in Hopkinton, just south of the starting-point of the Boston Marathon. But while the marathon goes straight to Boston in 26.2 miles, the Charles winds around for 80 miles before reaching its mouth in Boston. The Indians called it Quinobequin, �the river that circles around.� During its 80-mile course, the Charles drops about 350 feet. (Because of this drop, the Boston Marathon is considered a downhill race, so it doesn�t qualify for marathon records.) The biggest drop in the Charles is at Hemlock Gorge. 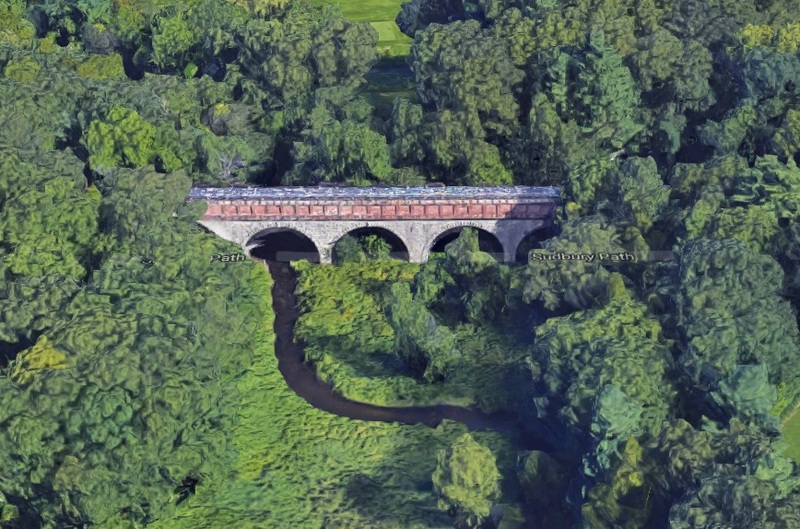 The Sudbury Aqueduct, which goes through Hemlock Gorge, is about 15 miles long, drops about 15 feet during its course, and can carry 80 million gallons of water in 24 hours. There’s a 2.5-mile trail around Wellesley’s Lake Waban; about half of this trail is owned by Wellesley College. For more information, visit WellesleyTrails.org. There are some pleasant trails through Wellesley (map here). Some of the trails in the area follow aqueducts, such as the Sudbury Aqueduct and the Cochituate Aqueduct. Here�s a 6-mile route from Wellesley Square to Hemlock Gorge. It follows the Fuller Brook Path, then the Sudbury Aqueduct. It also goes through Babson College, and along the edge of the Wellesley Country Club. It passes from Wellesley into Needham, then from Needham into Newton. If you walk back to the starting-point, it would be a total of 12 miles, so you may want to Uber back to the starting-point. South of Wellesley is Hale Reservation, in Westwood/Dover. Hale contains Powissett Peak, which has a view of Boston, and Hale connects to Noanet Woodlands. Hale is �private non-profit,� while Noanet is owned by The Trustees of Reservations. Hale is about 1,200 acres, Noanet about 550; together it�s open space of about 1,750 acres. One of the largest and most popular parks in the Boston area is Middlesex Fells, which straddles Medford, Winchester, etc. It has 2,200 acres, and includes several ponds and reservoirs. Medford also boasts the Brooks Estate, ancestral seat of a prominent Massachusetts family. The preacher-orator Phillips Brooks is from this family, as are Henry Adams and his brother Brooks Adams. Below is a map of a 5-mile walk in the western part of Middlesex Fells. Below is a map of Brookline�s �Secret Stairways and Paths.� The map was created by a group called WalkBoston. It�s a 4-mile loop, with lots of big staircases (you�ll get some exercise!). Below is a map that shows four squares (parks) in Brookline. These squares were created by David Sears II, when Brookline was first being developed. The map also shows 24 Cottage Farm Road, which has been called �a perfect example of a Gothic Revival English Cottage.� The cottage was built in 1850. The Waltham Land Trust has maps of Waltham trails, including a big loop called The Western Greenway. Click here for info about Natick walks, here for info about Weston walks, and here for info about scenic drives in Massachusetts.